How to fix a wall mount bracket for large televisions screens to the wall. 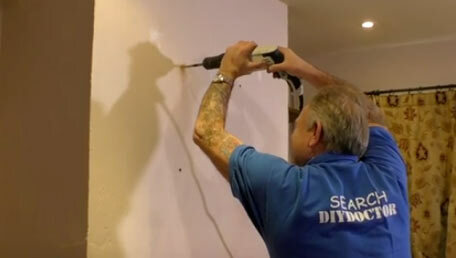 Learn how to attach a large LED, LCD or Plasma screens to the wall securely. This project covers 40 inch to 50 inch televisions, using pictures to explain each step to getting your large screen fixed to the wall. Why use a TV Bracket? TV Brackets are designed to fix a TV to the wall rather than use a surface to place the TV on. This can save a considerable amount of space. Most TV brackets however, in order to save the maximum amount of space, are fitted quite high up on the wall which can make viewing quite uncomfortable. Modern flat screen digital televisions all have the facility for wall bracket fixing. Essentially, the larger the television, the larger the wall bracket. Brackets come as fixed, twist and turn or twist, tilt and turn. For televisions over 40 inches the bracket is fairly heavy duty and therefore requires some heavy duty fixings. The best of these is the twist, tilt and turn bracket as it allows for viewing from almost every angle and at a height conducive to comfortable viewing. The best of these that we have found to date is the Mantel Bracket from Tranquil Mount. Almost every TV comes with the side brackets which actually fix to the television. These brackets have hooks in the top which, when fitted to the TV, slot over a crosspiece on the TV mounting bracket. Today’s TVs are made with the screw holes in place to receive these side brackets. This is called being VESA compliant (more later) but as there are many different types we have not shown this in full here as it may confuse. Suffice to say that, when the side brackets are fixed to the television, the TV then slots onto the main wall bracket as you can see from the video. VESA, or Video Electronics Standards Association is an association which sets Industry rules for the standardisation of (for one thing) the spacing of mounting holes in the back of a TV set to which wall brackets are fixed for TV mounts. These numbers are milimeters and explain the distance, both vertically and horizontally, between the screw holes in the back of the TV. 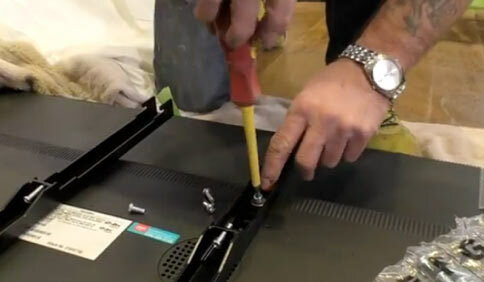 This allows TV mount manufacturers to make the TV bracket mounting bars with fixing holes in the right place. What is a Mantel Bracket? The dictionary definition of a mantel is any stone shelf, but it has primarily come to mean a shelf over a fire of a description and is usually referred to as a mantelpiece or mantlepiece. Both spellings can be used. A mantel bracket is a bracket which is designed to fit over the mantelpiece, or shelf, without disturbing any item placed on the actual shelf. Measure the height you would like the TV bracket to be fixed. Check the manufacturers instructions as to the height which will correspond to the top and bottom of the TV compared to the various parts of the bracket. It is very disappointing, especially with a twist, tilt and turn bracket, to fit the bracket nicely then realise the TV ends up not in the right place or at the right height. Mark the centreline of your TV bracket on the wall you are to hang it on. This line is useful if you want your TV in the dead centre of the wall and also, even if it is going in any position on the wall it is very useful as a double check that your TV mounting bracket is absolutely upright. To hang our bracket we have used 70mm long wall bolts with the associated wall plugs. The holes needed were 10 mm diameter but it is unwise to try to drill this size hole without first drilling a smaller pilot hole. Place the coach bolt alongside your drill bit then wrap some insulating tape around the drill bit so you can repeat the same depth of hole every time. As you can see the bracket has slots, rather than holes, for the fixings. This gives you plenty of play from side to side but the really important thing is to get the bracket level. You will notice from the image and the video that there is a very small level placed on top of the bracket while marking the holes. It is very important that the bracket is level as even if it is a couple of mm out of level it will be magnified by the size of the TV when it is hung. The bracket might only be a few mm out but the TV will then be 20 or 30mm out of level and look awful. The more expensive brackets have a built in bubble, or the manufacturer supplies a mini spirit level to check the level as you fix the bracket to the wall but always double check with a spirit level. Drill the holes for the TV bracket making sure the drill is level. 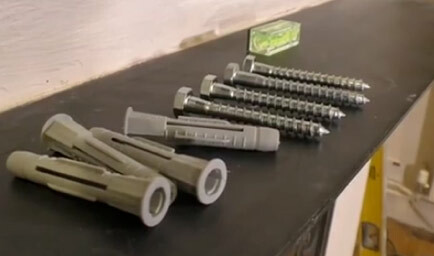 If the holes go in out of level, the screws may not line up properly when you attempt to put them in. When the holes are drilled, the wall plugs pushed in and the bolts are in place you are ready to tighten up on them using a suitable sized socket. The images below show you the next steps. Position the hook brackets on the back of the TV and line the holes in the brackets up with the screw holes in the back of the TV. Make sure the bottom of each bracket is the same distance from the bottom of the TV and the hooks are at the top. 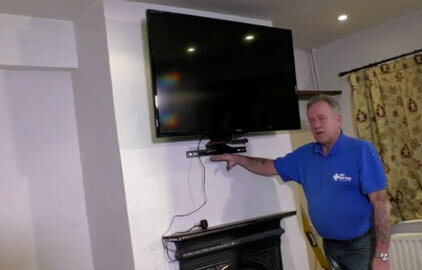 The TV is then lowered down on its hooks, onto the wall crossbar and a guide screw is tightened to stop the TV from accidentally being knocked off. The top and bottom runners have stops on them to stop the TV sliding off the end. Once the TV is in position on the bracket it can be slid to one side or the other and the bracket will allow you to face the TV at any number of angles. When the TV is fairly high on the wall you may need to adjust the swivels at the side to get the TV to face angle down a little. Once the TV is hanging properly on the wall brackets it can be swivelled into position whenever and wherever you want. The Tranquil Mount TV bracket, called the mantel mount is the one we have shown you in the images in this project and in the video. Not all brackets are as simple to fit as this one and they are certainly not as strong or versatile. Make sure you have the right TV bracket for the use you want to put your TV to, the height you want to view it from and the position in the room you will spend most time watching it from. Good luck with fitting your TV bracket and enjoy the comfortable viewing once it’s up! If you would like to find out more about the mantle mount by Tranquil Mount, check out our review here.